Seroquel (Quetiapine) is a powerful medication that can help patients balance the chemicals in their brain for a healthier and happier lifestyle. Usage of this medication must be closely monitored however, as some severe side effects may occur including weight gain, high blood sugar and high cholesterol. Of these, by far the most common was drowsiness which was reported in up to 53 percent of patients. Dry mouth was experienced by up to 44 percent. Up to 23 percent of patients experienced weight gain and high triglycerides as Seroquel side effects. If these side effects occur persistently or are particularly uncomfortable for the patient, the issue should be discussed with a health care professional. Adjustment of doses and other medications can be explored to relieve these issues. If you experience any of these severe side effects, contact a doctor immediately. It is generally not a good idea to stop taking Seroquel completely without the supervision of a physician. This medication is usually increased and decreased slowly to avoid additional adverse effects on the patient. Some side effects can be indicative of a very serious condition known as neuroleptic malignant syndrome (NMS). Left untreated, NMS can be fatal. If you experience changed heart rate, pulse and blood pressure, high fever, confusion, sweating and stiff muscles you should stop taking Seroquel and contact your doctor immediately. 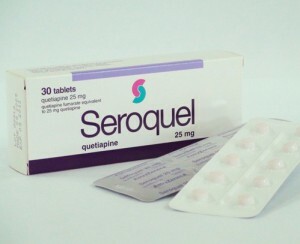 While on Seroquel, your doctor will perform several regular tests to detect any other side effects as early as possible. Increased liver enzymes, increased prolactin levels, abnormal thyroid conditions and low white blood cell count are all quetiapine and Seroquel side effects that your doctor will be looking out for. Seroquel can cause high blood sugar levels in some individuals. If blood sugar levels become extremely high, they can cause coma or death so patients should be aware of side effects that may indicate blood sugar is too high. These symptoms include extreme thirst and hunger, frequent urination, nausea, confusion, weakness and fatigue. Patients who are already at risk of diabetes will have their blood sugar checked regularly by their physician. Uncontrolled movements in the face and body can be one of the side effects of Seroquel. This is indicative of a very serious problem known as tardive dyskinesia and must be reported to a doctor immediately. Tardive dyskinesia cannot always be reversed, even after stopping the medication. In some cases, this side effect may first occur after the medication has been stopped. Weight gain is a very common side effect of Seroquel. Up to 23 percent of patients in studies of the drug reported gaining 7 percent of their body weight or more as a side effect. Rapid weight gain is very unhealthy and can contribute to diabetes. Careful changes in diet and an increase in physical activity can often keep weight gain at bay without the need to stop taking Seroquel. Under the close supervision of a physician, Seroquel can provide a solution for patients suffering from bipolar disorder or schizophrenia. Though Seoquel is not designed to be a single treatment that stands alone, it is very effective in conjunction with other treatment options.